Our KwikGoal Kwik Soccer Goal 8'x24' is an 1 3/4" O.D. x 1/8" wall around aluminum tubing Soccer goal. KwikGoal Lifetime Guarantee. The first Kwik Goal product. 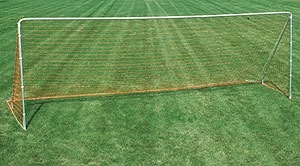 Designed for temporary fields which makes this goal ideal for tournaments. Push-button assembly allows this goal to be set-up and broken down quickly. Our KwikGoal Kwik Soccer Goal 8'x24' is an 1 3/4" O.D. x 1/8" wall around aluminum tubing Soccer goal. 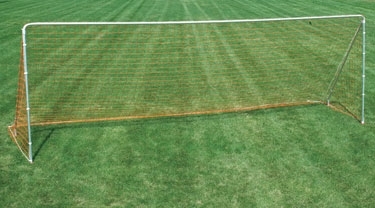 Designed for temporary fields which makes this goal ideal for tournaments. KwikGoal Lifetime Guarantee.